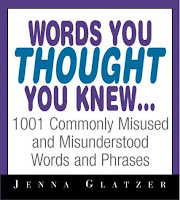 Instead of reviewing Jenna Glatzer's Words You Thought You Knew - 1001 Commonly Misused and Misunderstood Words and Phrases, I thought I would list the words from her book I discovered I misuse (the horror). I'd also like to share with you the gems I learned from her along the way. Adorable means worthy of being adored, and is not another word for cute. People often use since as a synonym for because, but it is not. Since refers to time, from a time in the past until the present. Comprise means "to be made up of" so the of is already included. You can say composed of, but it is incorrect to say comprised of. I'm guilty of this many times over, oops. I was really surprised to learn that flags are only at half-mast if they're on a ship or a Naval base. Everywhere else, they are at half-staff. I wonder if this is applies to Australia too. Did you know there's no such thing as a healthy meal? Healthy means having good health, but your food is healthful, bringing about good health. This mistake is everywhere you look and especially when it comes to packaging and marketing material. I didn't know that nauseous means sickening, disgusting or gross, so that something that is nauseous causes nausea or makes somebody feel nauseated. It's incorrect to plan on something and I'm definitely guilty of this one. It's correct to plan it, plan to or plan for something. I definitely didn't know this one, but presently doesn't mean now, it means soon. If something is happening now, it's happening currently. I'm guilty of misusing raise and rear - animals are raised and children are reared - but even now that I know the correct usage, I'm still reluctant to use them in this way. It just feels wrong, what do you think? The word vital comes from the Latin vita meaning life and should only be used to describe living things. Saying things like "it's vital that I have at least one can of Pepsi Max per day" is incorrect," because technically I can live without it. Even though we've all probably said and heard the phrase: "If that's what you think, you have another thing coming," apparently it's incorrect! The correct expression is: "if that's what you think, you have another think coming." It's surprising and even though it sounds grammatically incorrect, this is the correct phrase. Even now that I know the correct phrase, I think I'm just going to avoid this expression altogether, rather than have people trying to correct me each time. So, what about you? 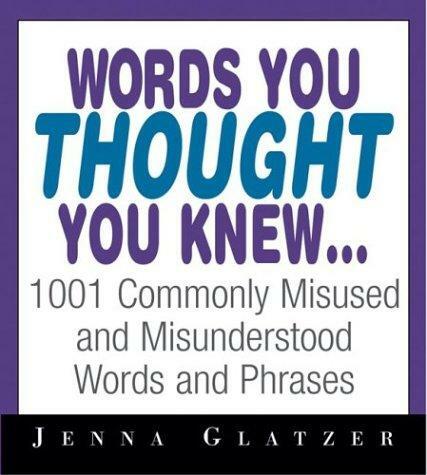 Were you guilty of misusing any of the above words, or were there any surprises for you too? I'd love to hear your comments, or hear about other words that bug you. Oh no...I guilty as well. This sounds like a great book for the coffee table! It is, it's the perfect book to pick up and read a page at random. I was reading it while watching the tennis. It's very interesting that you're not supposed to use "comprised of" in a sentence. But I wonder, what would the sentence look like without "of?" I suppose I'll just have to get the book and find out. So -- mission accomplished! You've piqued my curiosity . . .
Funnily enough, I used this (the word 'comprised' without the 'of') in a sentence just yesterday and it did look wrong/odd to me. I think it's going to take some getting used to.